Downtown North Bay has a brand new attraction this morning. 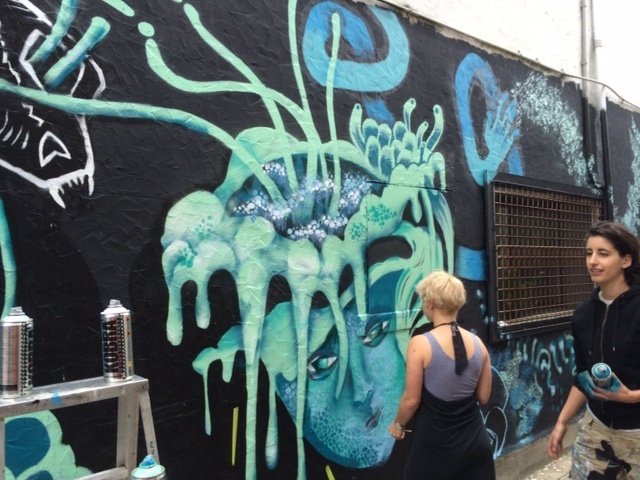 A 100 ft long mural was painted by a group of visiting artists from the collective Die Active. Photos by Jeff Turl. A group of artists from Thunder Bay left a gift this week to a city they describe as "beautiful". They were attending the Dream Big conference, a four day event of panel discussions, workshops and performances involving the arts. 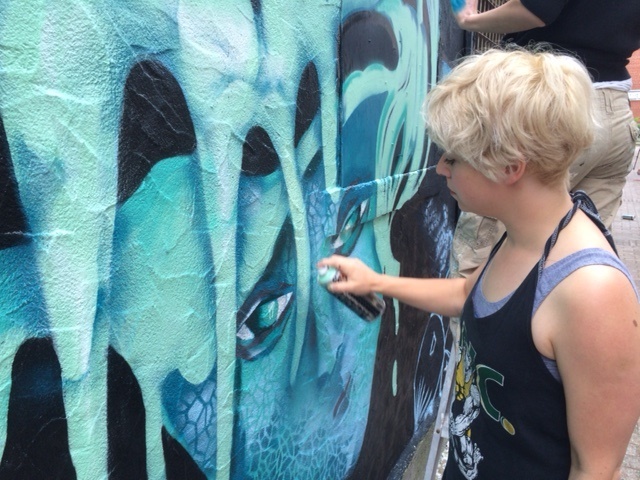 On Saturday morning, Lora Northway was busy leading a group of eight other graffiti artists painting a wall off Main St. W.
Northway works in a Thunder Bay art gallery full-time and is also a professional artist. "The mural is a reflection of all of the interests and ideas of the members of the Die Active Art Collective and young-blooded artists in general---all emerging artists that stay true to their own styles," she explained to BayToday. 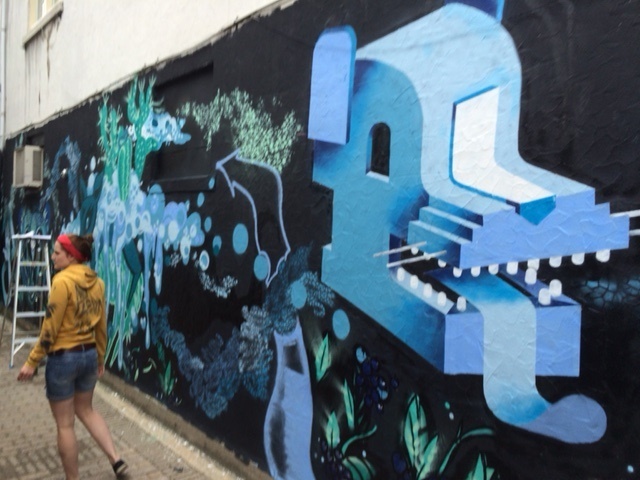 "This mural started off with a really loose concept to give everyone a chance to express their own ideas. The concept was to take the idea of a head, and expand it beyond just portraiture. So everyone has created very, very different work." 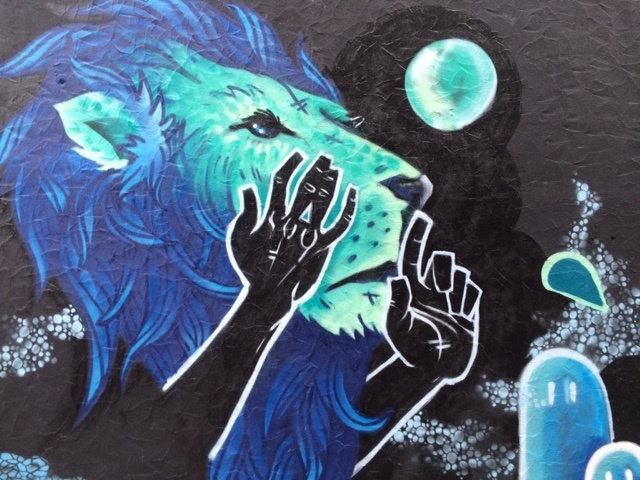 A bear head, blue berries and rubbery arms that stretch the length of the mural, reptilian faces with moss and goo dripping off of them, and a whispering lion all decorate the wall. "This is a present to show how communities of youth can pull together, and that they are responsible and talented, and they need to be given the space to show that in the city," said Northway. 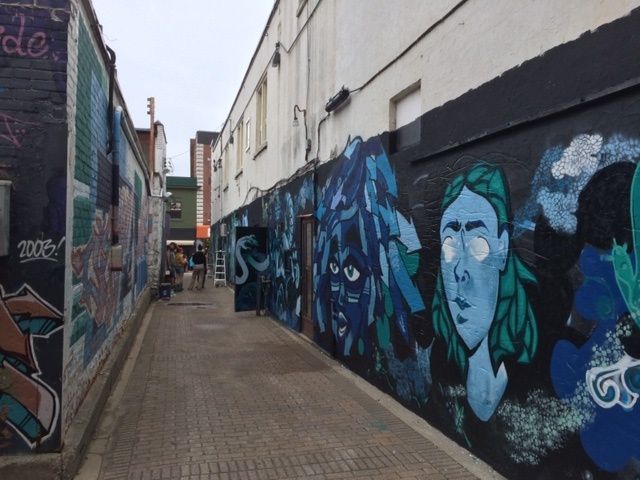 The group has done more than 20 murals in Thunder Bay and some members have exhibited works in graffiti festivals. Members also work as artists and graphic design illustrators and exhibit their own personal work as well. Most are professional exhibiting artists that were mentored through the collective and grew up to learn how to become professional artists through Die Active. The basic idea is born at a meeting the group holds to plan the artwork. They sketch and talk about colour. The wall is usually raw and flaky so the group scrapes and primes the surface first. Northway estimates the value of North Bay's mural is $10,000 when you add up artist fees and materials. "It was $2,000 just for the paint," she exclaimed. 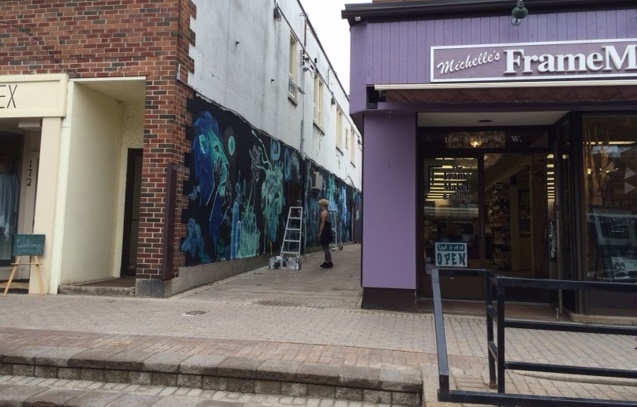 Northway hopes the mural will inspire young artists in North bay to form their own group. Downtown Improvement Executive Director Jeff Serran says the project came together quickly after Pat and Ralph Diegal offered the wall of their downtown building. "It's a win-win for us. There's a lot of people that use that lane to the parking garage.We thought they were only going to do one section, but they did the whole wall and it looks phenomenal. "When you have professional work like that 99.9 percent of the time it doesn't get tagged or vandalized. They don't touch work when it's done by other spray artists."